This immaculately groomed glacier greeted me as I stepped out from the funicular station on Saturday morning. I have been out of town for the past week and was pleasantly surprised by the snow that has fallen in my absence. Thanks to alpsaccom who posted this photo on Twitpic. Rumors of snow down to the village are true, though knee deep powder on the Lavachet button lift is a good few weeks away. I managed to get some great skiing in this weekend. Despite it being both British and French school holidays, it doesn’t seem too busy on the Tignes glacier. No queues longer than five minutes, and the pistes are near perfect thanks to the recent snowfall. Despite my pessimistic forecast, it looks like the Rossolin T-bar has been resurrected from it’s state of total mechanical failure. One of the lifts has all pylons in vertical position and with a bit of snow to cover the lift track, it could be ready within a week. The return to Tignes of my ski buddy Louis Nolan has brightened up my training agenda and we’re out on the GS skis tomorrow. I’ll try and keep updates coming thick and fast. This entry was posted in Snow Reports on October 25, 2009 by Rorie. It's an autumn skiing paradise in Tignes! I just managed to sneak in a morning skiing before I jet off on holiday for a week. The snow showers last weekend have added a much needed top layer of snow and the conditions on the Tignes glacier are excellent. Queuing wasn’t a problem today, even on the Champany T-bar which is sometimes a slow turn around. Unfortunately the chances of the Rossolin piste opening this autumn have been severely dashed. The 200kph winds that closed the glacier on Monday have caused catastrophic damage to the T-bars. It looks like the Vanoise chair is being prepared to shuttle the cross country skiers back to the funicular station, though that may prove to be a slow turn around for alpine teams who want to train on the lower slopes this half term. This entry was posted in Snow Reports on October 16, 2009 by Rorie. Cooler temperatures have helped maintain perfect race training conditions up on the Tignes glacier this weekend. Once again the only tourists on the glacier were from the Melezes, who wisely opted for the £99 3 day deal rather than £25 an hour at the Tamworth snow dome. 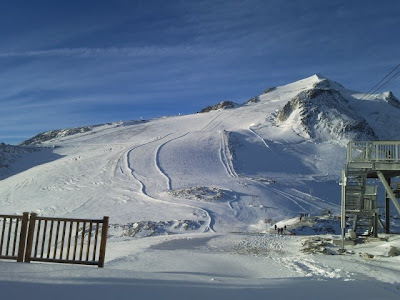 No new snow ensures firm conditions, that should challenge most visitors to the Grande Motte, though good weather and short lift queues guarantee an altogether pleasant experience. It looks like a change in the weather is on the way for this week. Hopefully the temperatures will stay cold enough for some of the first snow of the season. This entry was posted in Snow Reports on October 4, 2009 by Rorie.